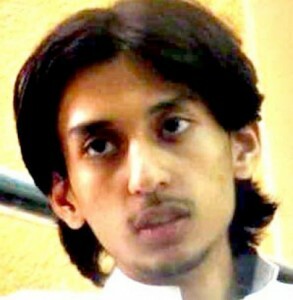 Hamza Kashgari was detained for 625 days for tweeting a mock conversation between himself and the prophet Mohammed. Saudi journalist and blogger Hamza Kashgari, detained for 625 days on blasphemy charges, has been released. The 23-year-old writer was arrested in 2011 when he tweeted a mock conversation between himself and the prophet Mohammed which sparked furious responses, including death threats. He tried to flee Saudi Arabia, but was detained in Malaysia and deported following a request by Interpol on behalf of Saudi authorities. Blasphemy is punishable by death in Saudi Arabia. You shouldn’t continue to tell a story that is not true. Interpol did NOT request the deportation of him. It was a lie by Malaysia who wanted to please the friend Saudi Arabia and made up this story. Interpol at the time reacted swiftly assuring that they had NOT put out such a request and that it was in fact made up by Malaysia. Don’t transport the lies of Malaysia on and recreate it thus in the net. Please stick to the facts that have been established at the time. News reporting should be prudent and not carry false reports.